The impression the world has is that FIFA is doomed to decay. Part of what threatens it is a widespread public rage against the institution and its behaviour over decades. At times, the way the men of FIFA have conducted their relations with other men (and women) of FIFA has been egregious in the extreme. From the tens of millions of dollars in bribes taken by the likes of the Brazilian former FIFA executive-committee member Ricardo Teixeira and the former FIFA president, João Havelange – among others – during the destructive relationship with its collapsed former marketing partner, ISL. To the black-market ticket scams run by the former FIFA vice-president Jack Warner. To the payments made by the Qatari former FIFA executive-committee member Mohammed Bin Hammam as he sought election to the FIFA presidency in 2011. To the $6,000 Chuck Blazer invoiced football monthly for the Trump Tower apartment he filled with his cats. Every passing day there seems to be a new allegation. The latest emerged in the Daily Telegraph on Thursday morning: that the suspended UEFA president, Michel Platini, had sought to suppress criminal investigation into his bank accounts through the civil courts. The Telegraph probably spoke for us all when it questioned what was his motivation in keeping things under wraps: what does he have to hide? Those close to Platini say he feared the contents of his private accounts being leaked back to FIFA. Whether you consider that valid or not, indeed, whatever his reasons, his legal claim was summarily dismissed by the courts. Such was the background to the investigation the Swiss attorney general, Michael Lauber, has launched into a SFr2 million Swiss franc (£1.3m, €1.8m, $2m) payment from FIFA to Platini that it alleges could be “disloyal” and constituting “criminal mismanagement” at FIFA. This latest criminal inquiry truly turns the screw: never before has FIFA faced so fundamental a threat. Although Platini is considered by the Swiss authorities as being “between a witness and a suspect” (Lauber’s words) it is the president of FIFA, Sepp Blatter, who has been formally named as a suspect in the case. Given that the nature of the inquiry became clear in September, this is not in itself a new development. But I have recently discovered that the implications of it extend far beyond the president himself and pervade deeply into the organisation he has been leading for the better part of the past two decades. I have written here previously how FIFA faces a systemic threat under the Racketeer Influenced and Corrupt Organisations chapter of the US penal and criminal code, which is the one being invoked in the US Department of Justice’s investigation into FIFA, football and related organisations. [See related article below.] But with the declaration of an investigation into Blatter, now it faces a pincer movement of criminal inquiries, each of which could end FIFA as an organisation. Liquidation is decreed by a judge, at the request of the competent authority or of an interested party, when the aim of the association is unlawful or contrary to morals. 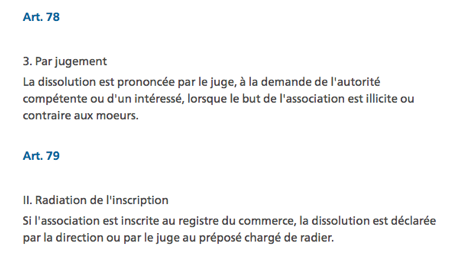 If the association appears on the companies register [as FIFA does] liquidation is declared by the board or by the judge to the officer in charge of removing firms from the list. Reading those Articles in conjunction with the words Loretta E Lynch, the US attorney general, used to introduce the US claim against FIFA and associated companies, and it shows that FIFA’s difficulties have now become existential. “Many of the individuals and organizations … were entrusted with keeping soccer open and accessible to all,” said Lynch. “They held important responsibilities at every level, from building soccer fields for children in developing countries to organizing the World Cup. This is deeply resonant of an organisation whose aim has become “unlawful or contrary to morals”. Should the allegations made against FIFA by the US Department of Justice and the Swiss attorney general be upheld, in the context of all the prior scandals that have shaken FIFA over decades, it would surely take only a simple request to the Swiss court from either party to shut down FIFA. Freud was quite right. And the fact that this overwhelming and merciless destruction would chime with the rage so many in the external world feel towards FIFA says it all, really. Journalist and broadcaster Matt Scott wrote the Digger column for The Guardian newspaper for five years and is now a columnist for Insideworldfootball. Contact him at moc.l1556264796labto1556264796ofdlr1556264796owedi1556264796sni@t1556264796tocs.1556264796ttam1556264796.